This is a handheld pong! Everything is contained in one handheld controller. The second controller can be mounted onto the main one, or detaches (it has a 2' cord). The system has an attached RF cable (no switchbox). This particular model comes with a pistol for use with target games, which has its own cord and plugs into the main unit at the top. There are two different models. One with 4 pong games, and another one with 2 additional shooting games sold with a lightgun. For this reason, there are two different types of boxes (see pictures section). There were also two different coloured models, there was the white with black print and black with write print. 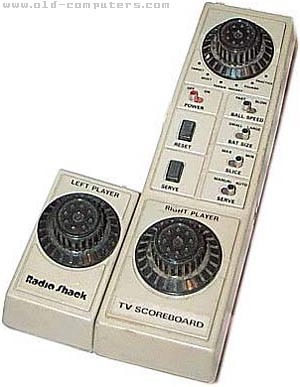 see more Radio Shack TV Scoreboard (handheld) Ebay auctions !